Hugh Verrier, a Maine painter and sculptor for over 40 years, exhibits his life-long love of the sea through this focus on water birds. Much of his artwork is inspired by living on the coast of Maine, working as a tugboat captain and later fishing on a commercial dragger. Working with various tools and media, Hugh has created watercolors, oils, sculptures and dimensional work with wood, stone, sand and paper. His paintings have appeared at the prestigious Maine Coast Artists shows, Memorial Hall Library in Andover, Massachusetts, the Maine Audubon Society gallery, and various other Maine galleries. Commissioned to create crosses for two area churches, Hugh carved the intricate and symbolic pieces in mahogany. His focus has now turned to the beauty of birds in flight with a unique approach to combining materials. This unique art has grown from the blend of two media: formed paper and watercolor. This involves the forming, cutting and painting of 300 lb. paper. 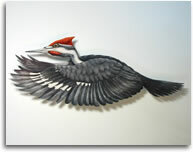 The effect is similar to bas relief, resulting in a lifelike, “dimensional” watercolor painting. 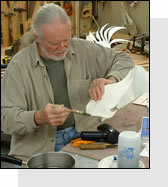 Mr. Verrier now devotes his entire time to his birds at his studio and gallery in secluded Eustis, Maine. Nestled in the mountains, with loons on the lake nearby, the gallery hosts a spectacular array of birds such as eagles, falcons and woodpeckers. 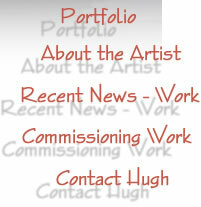 Hugh welcomes your visit and tour of his studio. 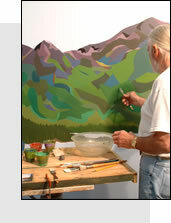 To set up your personalized tour, give him a call at his studio at 207-246-6694. If he happens to be out in the woods tracking his next project, please be kind and leave him a message. He returns all calls promptly.